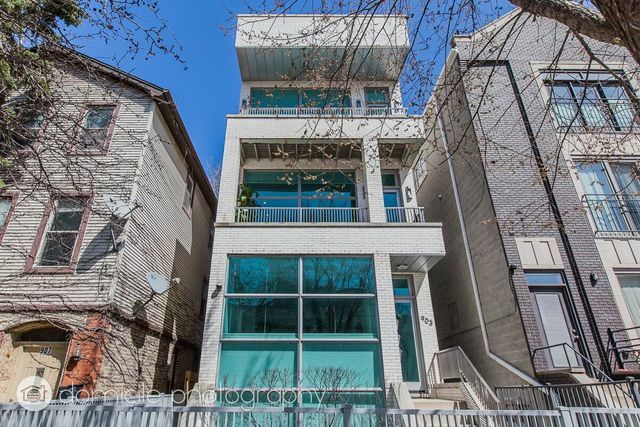 Simply Stunning 2 bed/ 2 bath Condo in East Ukrainian Village! All Brick, built in 2009 w/ &apos;Green Construction&apos; influences incl. Cellulose Insulation, On-Demand Water Heater, and Energy Star-Rated Appliances. Floor-to-ceiling windows in the living room give way to a spacious/prvt. front deck! Bright/Airy living room with cool gas fireplace leads to a sleek, open chef&apos;s kitchen with Bosch appliances, Nova kitchen cabinets, Quartz countertops; making this the perfect space for entertaining! Tray ceilings in the master bedroom, w/ access to another deck, is attached to a luxurious en suite bathroom: Double vanity, exceptionally deep tub w/ceiling drop water fill, body sprays in shower. Gated parking spot and large/well-lit storage unit incl. Tree-Lined, One-Way street; just a Few short blocks to the shops, restaurants, bars, and more of Division St. and Chicago Ave.! Make this your Urban Oasis!